Who doesn't love getting a gift, especially a bookish one? As soon as I read on Marie's blog (The Boston Bibliophile) that she was creating and hosting this holiday swap, I knew I had to participate. I've only read one Europa Editions book and I've always wanted to read more from this eclectic independent publisher. The swap is quite simple and I can't wait to meet other new-to-me bloggers and participate in growing my reading experience even more. Why not join along? 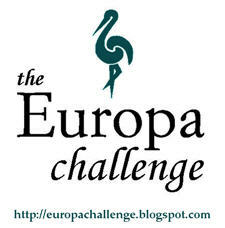 Email europachallenge@gmail.com on or before November 5th with your name and address and a list of Europa titles you'd like and if you are willing to ship your gift internationally. Names will randomly be drawn the week of November 5th and everyone will be notified who they are playing "Santa" to. Pick one of the titles the recipient has provided. And then we can either buy the book online, gift wrap and ship it, or we can purchase at an indie bookstore and then add a gift along with the package. We should include in that package who we are! Send your package by the first week of December to prepare for the holiday season. Please shop at an independent bookstore. You can also shop independent by going online at Powells.com and IndieBound.org will help find an indie near you. December 17th - post to your blog what you've received and what you've sent! Spread the word via Twitter, your blog, Facebook, etc. Why not join along? This should be a lot of fun to grow our reading lists and get to know other bloggers, along with just having a great time! Oh, I want to do this! Marie is so good at picking out the Europa titles, and there are so many that I would love! I am going to have to get moving on this one! Sounds fun! I think I'm going to have to participate! I love these Holiday Swaps - makes opening up the mailbox during the season so much fun! thanks for sharing! This does sound like fun, but I don't think I can add one more thing to the holiday season to-do list this time around. Maybe next year! Thanks for posting this Natalie! <3 You're the best!